Palestinian delegates have condemned suicide bombings in Israel as they promised key reforms by video link to a London summit. 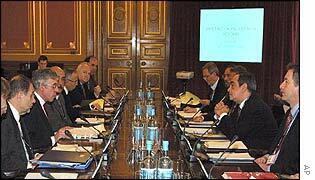 They also criticised Israeli restrictions on the Palestinian territories during the talks. The Palestinians joined the talks via the video link after being barred from going to London in the wake of the recent suicide bombing in Tel Aviv. Foreign Secretary Jack Straw called the talks "constructive" and said the Palestinian delegates had promised a new draft of a Palestinian constitution within the next two weeks. Speaking as the conference broke up, Mr Straw said Israeli restrictions caused problems for the Palestinian administration, but this could not be used as an excuse for failure to reform. The foreign minister said he regretted Israel's decision to ban Palestinians from attending the meeting in person. But the technology had worked well enough for there to be a proper dialogue. Mr Straw praised Palestinian progress on financial reforms but an independent judiciary was needed. That was "essential for the introduction of the rule of law in a comprehensive way inside the Occupied Territories", he said. Afif Safieh, the Palestinian representative to the UK, said reform was in the Palestinian authority's own interests. But the drive for change "should not be the tree that hides the forest" which was "dispossession" in the Occupied Territories, said Mr Safieh, who was at the talks. Earlier, Israeli Prime Minister Ariel Sharon has again voiced his disquiet about the summit, which has heightened tension between his country and the UK. The AFP news agency quoted Mr Sharon as saying: "Yasser Arafat cannot be trusted to carry out reforms which need to be performed in the Palestinian territories and not in London." The video link with Ramallah and Gaza started at 1200 GMT. During the talks, Palestinian officials stressed the problems they said were caused by Israeli restrictions on their movements. According to the AP news agency, Palestinian Information Minister Yasser Abed Rabbo also told the conference: "The suicide bombings will not bring us peace and confiscating of our liberty will not bring you security. "Let us together reject extremism in all its forms. Let us together choose the path of peaceful negotiations." Mr Rabbo also told reporters in Ramallah: "The Israeli occupation is responsible for hindering and creating all forms of obstacles of the reform process. "If they (the international community) want real reform they should move these Israeli tanks and forces from our towns and cities and villages." The conference brought together Palestinian and British delegates with senior representatives from Russia, United Nations, Jordan and Egypt. The European Union's foreign policy chief, Javier Solana also took part. Crucially, the US showed its commitment by sending William Burns, its main Middle East envoy. The peace talks are seen as a way UK Prime Minister Tony Blair can demonstrate his commitment to international issues other than war with Iraq. But Mr Straw insisted the drive for Middle East peace would be going on even if there was no Iraq crisis. Speaking on Monday, Mr Blair said it was important to get lasting peace in the Middle East. He said: "The reason why I think it is important to discuss political reform with the Palestinians is that there has been a sense in Israel, and outside, that, unless we get the right political mechanisms in place, it is difficult to make progress on the Middle East. "Ours is an attempt to try to secure that, to try and push that forward." "This was a comprehensive and constructive meeting"
"The reform process should be seen in the context of peacemaking"
"Palestinian leadership has to decide which camp it belongs to"